When it was announced that Netflix was reuniting 9 to 5 co-stars Jane Fonda and Lily Tomlin for a new online series, it was difficult to see how it could be anything but good. Indeed, the only downside was the lack of Dolly Parton. However, the series itself, Grace & Frankie, turned out to be better than we could have hoped, giving both Tomlin and Fonda plenty of space to show off their talents, while also telling a fun and timely story. Last year Netflix made a concerted effort to make shows that would appeal to a slightly older demographic than the young people the service is known to attract in droves. One of the classiest bits of original programming was Grace & Frankie, starring Lily Tomlin and Jane Fonda as two married women approaching old age, who get the shock of their lives when their husbands (Martin Sheen and Sam Waterston) don’t just announce they’re leaving them, but that they’re gay and in a relationship. Now Season 2 is on its way and the trailer has been released. Here’s the synopsis: ‘With their ex-hubbies now married to each other and their clans more integrated than ever, Grace and Frankie continue to struggle to make sense of the brave new world that is their lives. Frankie copes by getting more involved in Brianna’s business.’ Take a look at the trailer below. It’s only been online a couple of weeks, but Netflix must be feeling they’ve got a hit on their hands with Grace & Frankie, as they’ve already ordered a second season, according to Variety. It’s not too surprising it’s been a success, as it was co-created by Friends’ Marta Kauffman and stars the impressive quartet of Jane Fonda, Lily Tomlin, Martin Sheen and Sam Waterston. Who wouldn’t want to take a look at that, even if you didn’t know what it was about? Grace & Frankie is about old friends turned enemies, who suddenly find common ground again when their husbands leave them and run off with one another. Season 2 will hit Netflix in 2016. 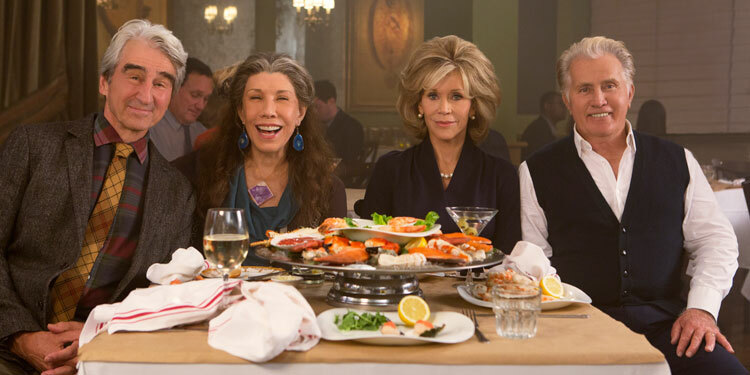 Casts don’t get much better than Jane Fonda, Lily Tomlin, Martin Sheen and Sam Waterston, but that’s who Netflix have managed to get together for the upcoming Grace & Frankie. Now they’re showcasing the series with a trailer and a set of posters which you can see above and blow. 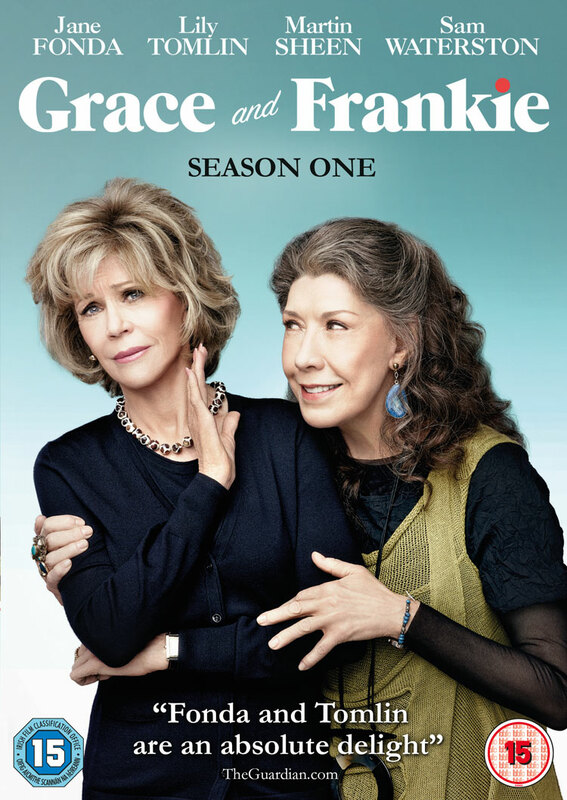 Here’s the synopsis: ‘In Grace and Frankie, Jane Fonda (“Grace”) and Lily Tomlin (“Frankie”) star as two women whose lives are suddenly turned upside down when their husbands reveal they are gay and leave them for each other. Both sparring partners and partners-in-crime, they form an unlikely bond to face an uncertain future together and discover a new definition of “family,” with laughter, tears and plenty of mood enhancers along the way. How would to longtime female friends react if their husbands ran off with one another in their autumn years? That’s the central premise of Grace & Frankie, Netflix’s new show which features the illustrious central cast of Jane Fonda, Lily Tomlin, Martin Sheen and Sam Waterston. Now the first image from the show have arrived, along with a commentary from Fonda and Tomlin about what they show us. Jane: After our husbands’ big reveal, Grace and Frankie bond at a beach house. This specific scene takes place the morning after Lily’s character Frankie spikes my tea with peyote. Lily: They did a great job by mixing seaweed into my hairdo. Jane: More like a hair don’t. It suits you, though. Nice and salty.